1. Saute the minced garlic in lard until lightly brown. 2. Add in the chopped onions. 3. After about two minutes, add the chopped tomatoes and saute for about 3 minutes. 4. Add the pork cubes, seasonings and tomato sauce. 5. Cover tightly and simmer until the pork is half-cooked. 6. Add the diced potatoes and liver. Cook until the potatoes are done. 7. If the mixture is drying out, add water. 8. The chickpeas should have been cooked beforehand. If you're using canned chickpeas, there's no need to further cook them. Add the chickpeas and the bell peppers to the menudo stew a few minutes before serving. Other ingredients you can use: carrots, green or yellow peas, red chili peppers. Balance out the colors. 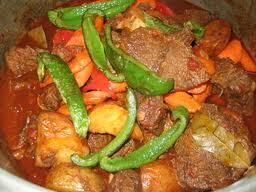 The tomato sauce combined with the potatoes create an orange-red stew with bits of green.